What are the typical symptoms associated with an injury to the thumb extensor tendon? What can be observed in a thumb extensor tendon which incurred a cut from a knife or a piece of broken glass? What needs to be done in a case like that? What does this look like on an individual basis? How can it be that after a distal radius fracture a thumb extensor tendon ruptures as well? What causes a rupture in a thumb extensor tendon? When do we typically find ruptures of extensor tendons following a distal radius fracture? What is the precise cause of these ruptures? Could malpractice be the reason? What happens if there aren´t any irregularities in the area of the bone tunnel? This mostly depends on the exact location of the injury. Unlike in other digits, the extensor tendon above the distal interphalangeal joint of the thumb may rupture. In a case like that the same therapy approach as for the subcutaneous rupture of an extensor tendon to a digit applies, meaning that typically a conservative therapy approach such as a stax finger splint will be selected to treat the rupture. 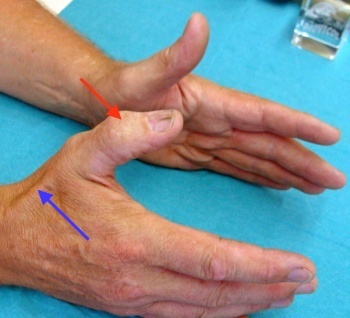 The image shows a case of ruptured extensor tendon above the distal interphalangeal joint of the thumb (red arrow). The extensor tendon right about where the metacarpus is located can easily be visualized through the skin (blue arrow). 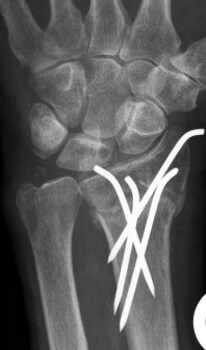 The image shows a ruptured extensor tendon above the wrist. The thumb can no longer be properly stretched out. 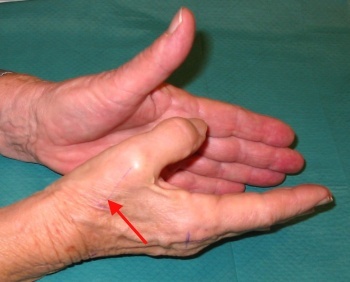 The extensor tendon in this case cannot be spotted in the metacarpus area (red arrow). Depending on the exact location of the injury, the distal interphalangeal joint or even the entire thumb may not be stretched out properly anymore. If the injury is located above the distal interphalangeal joint, the patient may still be able to spread the thumb apart; however, an isolated bending motion of the distal interphalangeal joint is no longer possible. 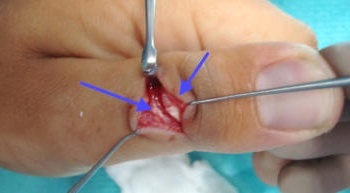 An open cut to a thumb extensor tendon requires a surgical intervention. First the entire arm is put under anesthesia. Once a bloodless operating surface is secured with the help of a cuff, the identification of the injured tendon begins. At times this may not be as simple as one may think, since the tendon ends tend to pull away quite substantially. Once the tendon ends could be located, they are fused with the help of specific suture button techniques. The image shows a picture taken during surgery on a torn extensor tendon in a thumb. The blue arrows point towards the tendon ends. The immobilization of the thumb over several weeks either through a wire or splinting is required in this case! After a distal radius fracture, cracks may appear on either the thumb flexor tendon or the thumb extensor tendon. The most common ruptures occur in the thumb extensor tendon. Ruptures in extensor tendons can be found either after surgically treated distal radius fractures or after conservatively treated distal radius fractures. One of the reasons could be friction of the tendon against wires or protruding screws, which have been used in connection with a surgical procedure performed on a fracture. The removal of metal material in the opportune moment may be able to prevent these tendon ruptures. In most cases these ruptures of thumb extensor tendons can be observed once the patient is able to move the wrist again, typically five to eight weeks into the procedure. The concerned patients often report of short-term pain along with a swelling in the vicinity of the extensor side of the wrist. Straining day-to-day activity frequently leads to the rupture of the tendon. Once that sets in, the patient experiences a sudden limitation of stretchability of the thumb. However, this kind of damage to the thumb extensor tendon does not always occur within the first months of a distal radius fracture. In isolated cases even years or decades after the distal radius fracture took place, the thumb extensor tendon may still rupture. The main cause of these ruptures can be found in the particular course of the extensor tendon above the radius. Even when looking at a healthy thumb extensor tendon one can easily see that the tendon takes a slanting course in the wrist area. If one could see further through the skin, one would see a bony ridge close to the radius, which the tendon has to circle around. If – in the case of a distal radius fracture – the bony ridge becomes irregular (Lister´s tubercle), over time (several weeks or sometimes even years) the tendon may wear down due to added friction imposed upon it leading to a subsequent rupture. In hand surgical terms this is been referred to as rupture of the extensor tendon EPL (extensor pollicus longus, meaning rupture of the long extensor tendon of the thumb). Even if there are no irregularities in the area of the bone tunnel where the long extensor tendon of the thumb runs, a rupture following a distal radius fracture may still occur because of tearing vessels which serve the purpose of nourishing the tendon. The now malnourished tendon is particularly prone to any kind of straining. It is then possible that the tendon will rupture even when performing day-to-day activities. In every day’s life both mechanisms (small irregularities to the bone tunnel as well as malnourishment of the tendon through torn blood vessels) may play a role in the rupturing of thumb extensor tendons.